Breath in the ice, it's -30C as we fly north to the Yukon, awash in the legends of the Klondike Gold Rush, sparkling with pristine natural beauty. The severed human toe splashes into my glass tumbler, spilling drops of sweet Yukon Jack whiskey on the bar counter. It sinks, the nail still attached, scraping the glass with post-amputee growth. Brown and withered, there's no doubting that this-here toe once belonged to some not-here person, and all these years of being kept in salt and soaked in honey whiskey have kept the skin intact. I'm in the Downtown Hotel in Dawson City, lost in the Great Canadian North, and the weather outside is a balmy - 30C . That's minus thirty, in case you thought that was a dash. Captain Al, tonight's Toemaster, has a creepy grin with coffee-stained teeth. As I look on in a blend of one third disgust, one third morbid fascination and one third fear, he commences the ceremony, reading from a prepared text with great fanfare. Although there is nobody in the bar, this freezing night in the north, he draws the attention of the unimpressed bartender, along with the ghosts of the saloons' former gamblers and whores. Finally, he reaches a climax. "Drink it fast, or drink it slow, but either way, your lips... must touch... this gnarly looking toe." Never one to shy away from a challenge, even when it involves what might be considered cannibalism, I raise the glass, and tuck my head back. I've been to bars before in the hope of meeting a nice girl and getting her digits, but this is just outrageous. There's a magazine out here in the Yukon called North of Ordinary. Fitting, for this is a harsh, breathtaking land of natural beauty and pioneering human spirit - what happens when an extreme climate meets an extreme population. Bordering Alaska in the northwest corner of Canada, the Yukon Territory is bigger than Germany, Belgium, Denmark and Holland combined, yet has a population of only 32,000. Most people live in the capital of Whitehorse, which can hit 30C plus in the summer, and has recorded temperatures as low as -52C in winter. Don't get sunburnt. 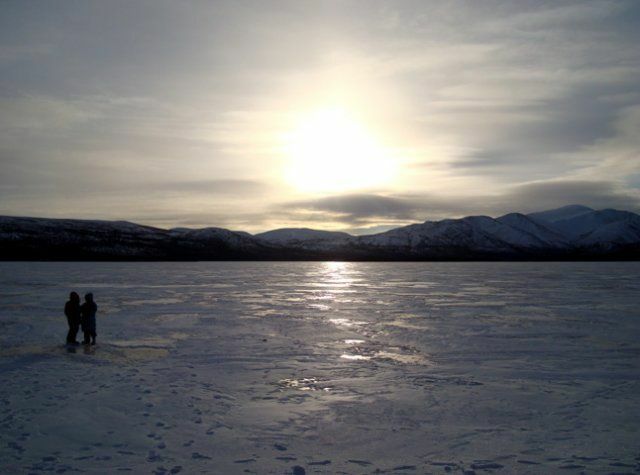 Snow capped mountains and pristine lakes, a sparse subarctic dry climate where moose outnumber people two to one, and people drink 50% more beer than any other province or territory in Canada. The Yukon would probably have remained an isolated northern region, populated by small indigenous bands who have survived on caribou for thousands of years, if not for a mineral rich in value but poor in practical use. In 1896, gold was discovered on the Klondike River, and w hen several dozen miners arrived in Seattle loaded with their takings, word spread as fast as the fading career of a American Idol finalist, as loud as a sonic boom in a bathroom, as clear as the skin of an android. Within a few months, some 40,000 people raced feverishly to the Klondike to stake their claim, the miners, the cowboys, the hucksters and gamblers, along with the riff-raff and rabble needed to serve them. Bonanza Creek, Eldorado - few fortunes were being made, more dreams were lost. Legends were created, it was here that Jack London wrote White Fang, where Robert Service wrote epic poems like "The Shooting of Dan McGrew" and "The Cremation of Sam McGee." Charlie Chaplin starred in "The Gold Rush", Mae West in "Klondike Annie" - the wild west became the wild north, and saloon doors swung to the tune of can-can dancers . Dawson City became known as the Paris of the North, the largest town north of San Francisco, as lucky strikers would blow their earnings on all manner of wonders designed to separate a fool from his gold. Railways were built to shuttle the stampeders, and the Canadian government created a new territory to deal with the influx, but we all wake up in the morning, and all dreams give way to reality. Even though the gold strike was significant, it was not large enough to support the amount of those seeking it out, and when winter arrived, freezing over rivers, blackening hands with frostbite, the rush ended, the population draining like water from a tub. The government consolidated mining interests, built highways that devastated aboriginal bands which had no resistance to western illness or alcohol. The rush lasted just two years. Today, the mining of lead, silver, gold and copper still brings in the moolah, but the government is by far the largest employer - almost 1 in 3 people in Yukon's labour force work for the Man. The second most important industry, is tourism. Whitehorse is not in the Arctic Circle, so there is no Arctic Night at this time of year. Instead, it gets light around 9am, and dark around 3pm, and in between its too damn cold to want to be outdoors too long anyway. Unless you want to go dog-sledding, in which case you have to speak to Frank Turner. I can see my friends the animal activists, frothing already, sitting with their Great Dane in their small apartment, wondering how anyone could dare harness a half dozen huskies and have them pull them through the snow on a sled. They don't see dogs treated with love and respect, not to mention the latest in homeopathic and naturopathic food and medicines. Here are those few huskies living li fe as they were born to, in the right environment, with the right exercise and purpose - not for a half hour daily walk in the park. For contrary to what you might think, it's the doggone dogs in control, not the guy on the sled. If the dogs are not happy, if the rider and pack don't work as a team, then nobody is going anywhere. Including me, since Frank was taking me out to frozen Fish Lake for my chance to mush. 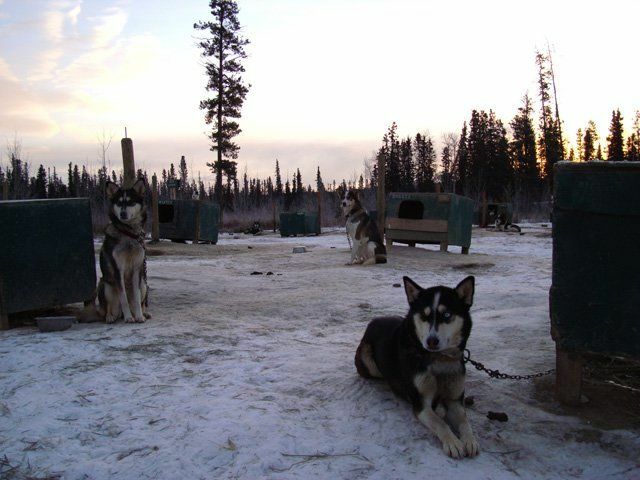 Frank's Muktuk Kennels has around 120 dogs, all named, loved and cared for. He doesn't sell puppies or dogs, the old guys are retired and remain free to run around, sleeping indoors on blankets, becoming part of the 102 acre ranch. Along with Japanese and German volunteers, tourists, large black ravens, and Frank's wife Anne who keeps it all together. Each dog has their own kennel, and is chained up in "streets" according to gender. It's quite the site, arriving from Whitehorse on a ranch and being greeted by a hundred dogs going bezerk at your presence. Puppies are reared and exercised, and each dog is as friendly as a family pet (which in a way, they are). They have names of composers or birds, previous guests and heroes. Bet your life there's going to be a Gonzo. It's nearly 9am and still dark as we gather the huskies for the drive to the lake. Friendly Frank is a legend in the Yukon and beyond, he's the only guy to race the Yukon Quest 23 consecutive times - a gruelling solo 10 day dog-sledding race whereby competitors have 4 hours sleep per day, travel 1000 miles through brutal conditions (cold enough to literally freeze the dog's balls), and have to ensure that everyone reaches the finish line healthy. Frank has more stories than whiskers on his thick gray beard, and you just know that here is man who has stared into the very depths of his soul, and found a husky barking right back at him. They have saved his life, and he theirs. As I pick up a lab-husky cross named Livingston, Frank tells me about the sport, the art of keeping the dogs happy, and how to survive in the wilderness. He's kitted me out head to toe because all the warm stuff I brought along would ice over in these -20C climes. Meanwhile, he hasn't put his gloves on yet. He teaches me to slow howl at the dogs and soon enough there's a chorus of howls echoing in the forest. I learn to say "Gee" for right and "Haa" for left and "Whoo Whoo" to stop (which I struggle with because, as Dr Seuss might say, it's pretty serious Go Dog Do out here. The sleds have brakes and foot pads, and it takes a while before I get the hang of it. If the dogs run too fast they might get injured. I have six dogs harnessed to my sled, and, as the saying goes, unless you're the lead dog, the view is all the same for them. As the rider, I gawk at the low tundra mountains surrounding the frozen lake, tears freezing on my cheek, passing Frank on the left with yelling "Gobuy Gobuy" so the dogs don't get themselves tangled. It's exhilarating and thrilling and one of those things you read about and should think: I wish I could do that. Which, of course, you can. We spend a couple hours racing along the snow and ice, and I slowly get to know my dogs, their personalities, their strengths. Val is a firecracker, Falcon a steadying force. Incredibly, a healthy Quest pack can travel around 160km each day, at a speed of around 15 - 20km/hr, depending on conditions. I imagine Frank's experiences, wrapped up freezing in the sled for a few hours, under the hot-ice stars and glowing northern lights, and wonder if I could ever do it. Then I remember I'm a city boy, and will probably succumb to hypothermia within hours, which will leave the dogs in a fix, so they'll have to eat me. But all is not lost, Frank is originally from Toronto.